King Marine Electronics and AutoPilot repairs. Rebuilt AutoPilots now available with 3 year warranty. For mechanical, hydraulic, rack and rack & pinion steering. 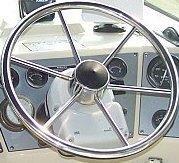 We specialize in repairing King Marine AutoPilots. Visa, Discover and Master Cards are accepted.